There was a big blasting news by The Wall Street Journal on Monday. The report published said that Microsoft Corporation is approaching to buy the most popular telephonic company over internet i.e. Skype. According to the published report it would be the biggest deal in the 36 years history of software maker’s. If the deal gets final the deal is valued at $8.5 billion, including assumed debt. This $8.5 billion would be Microsoft’s biggest previous acquisition, earlier they had a $6 billion purchase of online ad service aQuantive in 2007. 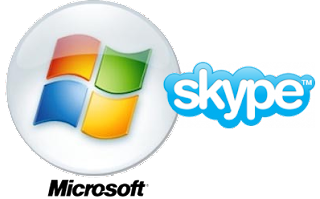 Buying Skype will potentially increase the communication tool for Microsoft over internet, Microsoft always tries to make a splash over internet and this could be a great splash. Speakers from Microsoft and Skype declined to comment on this report on Monday. A statement from either of the company’s speaker was awaited till Tuesday morning, but a statement is still to come. Microsoft To Buy Skype in $8.5 billion—-WHY ;when they cud h’ve simply downloaded it for free.. I simply want to say I am new to blogs and actually savored your blog. Probably I’m planning to bookmark your blog . You really come with awesome article content. Kudos for sharing with us your blog site.